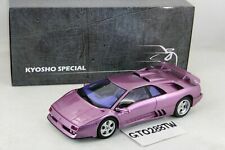 GT Spirit / KYOSHO 1994 LAMBORGHINI Diablo Jota SE30 WHITE LE of 500 1/18 New! Make Up / EIDOLON EM374B 1/43 1995 Lamborghini Diablo SE30 Corsa PO.01- 25 pcs! This page was last updated: 25-Apr 19:47. Number of bids and bid amounts may be slightly out of date. See each listing for international shipping options and costs.